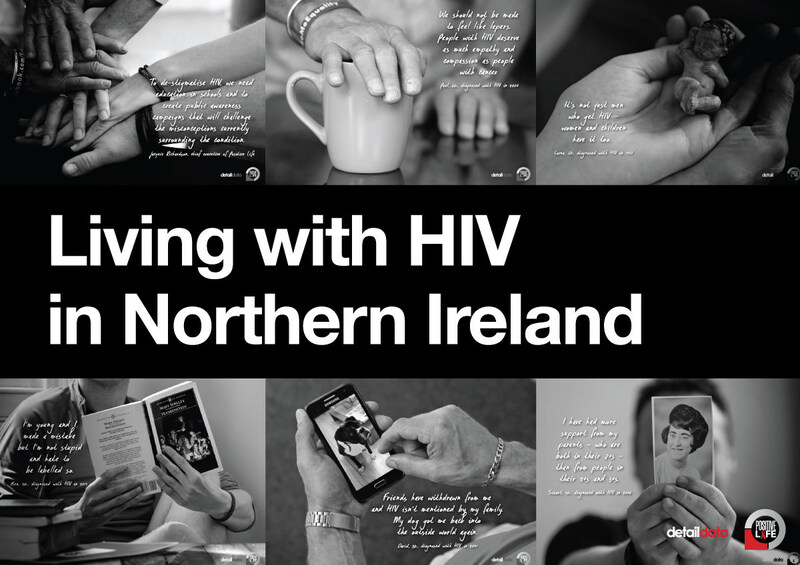 Detail Data has examined the newly released 2015 HIV surveillance data for the UK and, in a joint project with the dedicated HIV charity Positive Life, we tell the stories of five people living with the virus in Northern Ireland. They told us that they live with a condition still heavily affected by stigma and misunderstanding. “Positive Life are calling for and lobbying hard for a sexual health strategy because without it we don’t see any investment and we think it’s really, really important that money is put into education so that young people know how to look after themselves and know how to take charge of their own sexual health,” she said. “We also would like to see investment in public awareness raising and campaigns to challenge the old stigmas and the old perceptions of the 1980s and bring people right up to speed with HIV and what HIV means to people living with it in Northern Ireland. "The fact that 103 more people have been diagnosed with HIV is very worrying and strengthens the argument that we need a new strategy. We need to raise awareness and encourage people to look after their own sexual health." Dr Say Quah, consultant in Genitourinary Medicine at the Royal Victoria Hospital in Belfast, backed the call for a new strategy. The Department of Health told us it has asked the Public Health Agency to host a workshop with key stakeholders "to review progress and consider the next actions to inform a regional sexual health action plan." A total of 557,009 HIV tests were carried out in Northern Ireland in the 15 years from 2000 to 2014. Self-testing became legal in January of this year. The main self-testing kit provider did not respond to a number of requests from us about the number of tests sold into Northern Ireland since then. As part of this project, we asked the Department of Health and Public Health Agency (PHA) if we could have the 2015 HIV data for Northern Ireland but were told that the PHA would not be putting these figures out until shortly before World AIDS Day on December 1st. 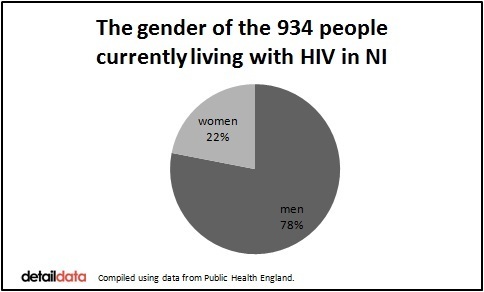 However, we were able to access the Northern Ireland data from Public Health England which recently published the 2015 HIV statistics and historic data for the whole of the UK. The local figures have not yet been put into the public domain by our Department of Health. 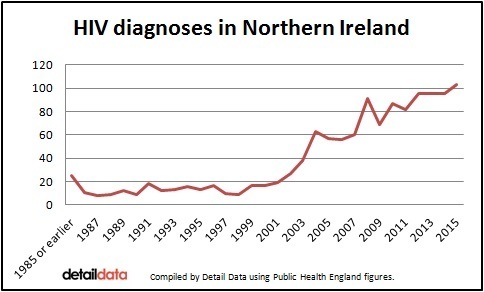 From 1985 or earlier, a total of 1,253 HIV diagnoses have been recorded in Northern Ireland. Of these cases, 75% were aged between 25 and 49-years-old when diagnosed. Six were children aged under 15 at the time of diagnosis and 17 people were aged 65 or older. A total of 126 HIV-diagnosed people in Northern Ireland have died – this includes AIDS and non-AIDS related deaths. Others may have moved out of Northern Ireland since their initial diagnosis. The regional centre for the care of people living with HIV is based at the Royal Victoria Hospital in Belfast. The team includes consultants supported by other medical, nursing, health advisor, social work, pharmacy and clinical psychology staff. 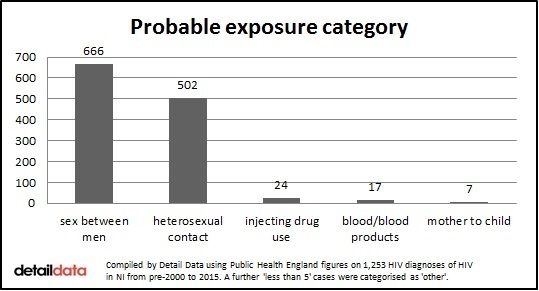 The cost of treating HIV infection for one person is estimated at almost £380,000 over their lifetime. The people currently receiving treatment are 729 men and 205 women. The ethnic group of 777 is white and 114 are recorded as being ‘Black African’. Jacquie Richardson said: “There are a lot of challenges that come with an HIV diagnosis including adherence to medication and the impact on people’s physical health. Medication for the physical condition has progressed immensely since the 1980s. “The biggest challenge that people with HIV face is living with the stigma uniquely associated with the virus. They don’t share the fact that they are living with this life-changing condition and that has an ongoing impact on their mental health and their ability to just be and to live fulfilled lives. Late diagnosis is an issue here with around half of cases diagnosed as advanced HIV. Separate data obtained by Detail Data from the Public Health Agency also shows that 114 pregnancies were affected by HIV in the 10 years 2005-2016. The virus was detected during the routine antenatal testing of pregnant women. These pregnancies were carefully managed to prevent transmission of the infection from the mother to child. Dr Quah said that the prevention of mother to child transmission of HIV is “one of the most successful stories in the timeline of HIV care”. “The antenatal screening program started around 2003 in Northern Ireland and the uptake of testing is almost universally accepted by all pregnant women since," he said. “With early detection, effective HIV treatment for the mother, avoidance of breast feeding and a short course of preventative treatment for the newborn we are able to prevent transmission of infection from mother to child. In Northern Ireland we have to date achieved this in every case. The Public Health England data tells us that seven people diagnosed with HIV in Northern Ireland are thought to have contracted the virus as a result of mother to child transmission but it is likely therefore that their births took place outside of Northern Ireland. Click here to read Dr Quah’s full response to our questions about treating HIV in Northern Ireland. Facilitated by the charity Positive Life, we brought five HIV positive people together in Belfast to tell their stories and to take part in a photography project. Their ages range across 40 years and their HIV diagnoses are, in some cases, decades apart. Ben recently graduated from university and is in his 20s. Lorna is a mother in her 60s who received her diagnosis in 1988. They were joined by David, Paul and Stuart. The names are all pseudonyms to ensure that they cannot be identified – but this need for anonymity is something they all struggle with. The group agreed that, in an ideal world, an HIV diagnosis should result in the same sympathy and support as a cancer diagnosis but they know that the reality is that some people still fear physical contact with someone with HIV. Paul, who is in his 60s and had a late diagnosis in 2000, recalls sitting with someone who placed his hand over his cup of tea as they spoke. A work colleague of Stuart’s sympathised with him but refused to shake his hand in case he infected his children when he went home. However, it’s not all negative. Ben is in his 20s and was diagnosed with HIV in 2014. He has had good support from the majority of his peers and thinks that the attitude of the younger generation is more positive. We asked the group to bring along an object for the photography session. Their words aim to challenge some of the myths associated with HIV. The photographer focused on their hands to ensure they could not be identified in the images. Click here to see the photographs and read their stories. The photographs are being exhibited by Positive Life today at CastleCourt Shopping Centre in Belfast where people can also sign their petition calling for a new sexual health strategy. Stuart, who is in his 40s, was diagnosed with HIV eight years ago. He took part in our photographic project and also agreed to feature in a more detailed video interview. He asked us not to use his real name. He said: “My diagnosis came as a bolt from the blue. I remember leaving the Royal and sitting in my car in the car park on the top of the hill and staring out and just thinking to myself ‘Okay. I’m HIV positive and I can’t tell anyone.’ So I sat there for about an hour and pulled myself together before driving home and not mentioning it again to anyone for the next five years. “It even got to the stage where I stopped answering the phone in the house. I know that might seem like a silly thing but when you feel like you can’t talk about the biggest thing in your life, which is that you’ve just been diagnosed with a chronic condition, you feel like you can’t talk to anyone about anything. Stuart feels positive about his future. “I’m living with HIV. I am no longer being dictated to by the virus which happened for a long time. It dictated where I went. It dictated who I spoke to. It determined how I live my life. That no longer happens. He feels strongly that there needs to better understanding of HIV. “There is a lot of ignorance out there. I don’t get angry about it anymore because you can’t blame the public for not knowing more about HIV when they’re not being told anything about HIV. “The last big advertising campaign was the one we all remember from the 1980s with volcanos erupting and tombstones collapsing and people still see it as a death sentence. Improved drug treatments mean that people diagnosed with HIV can now expect to live well into older age. Almost a third of people (31%) currently being treated for HIV in Northern Ireland are aged 50 or older – compared to around 17% in 2006. Thirty-five people are aged 65 or older. There is also some evidence that people living with the virus can be affected by chronic conditions commonly associated with age – like cardiovascular disease and arthritis – at an earlier stage. A growing elderly population with the virus means that HIV will now be an issue for social care services for the elderly and also within residential care and nursing homes. We put a series of questions to the Department of Health via a Freedom of Information request relating to any preparations which have been made to support and care for people living into old age with the virus. We asked the department how many care homes in Northern Ireland cater for the specialism of HIV/AIDS. We also requested the name and address of these homes, how many HIV/AIDS patients they can care for and what service each offers. The department said this information is not held in the department and advised us to contact the Regulation and Quality Improvement Authority (RQIA). We asked the PHA for a copy of the guidance. It provided a link to the Northern Ireland regional infection control manual and said this is the manual healthcare workers are referred to. It only mentions HIV as one of a number of communicable diseases and states that it can be spread through sexual contact or via blood. There appears to be no specific guidance for healthcare staff on how to treat a patient with HIV. Our final request was for any documentation held by the department on caring for elderly people with HIV/AIDS in Northern Ireland’s care homes or other health care settings including any email correspondence, briefing papers, correspondence and any other documentation. Dr Quah said there is a need to improve HIV awareness in all health settings, including care homes. He said: “People living with HIV are living longer which is a good thing. “As our patients age, there will be an increase in health related issues associated with aging such as cardiovascular diseases, cancers, bone and kidney problems, confusion and dementia, and falls. With most of these, people living with HIV with these age-related problems do not usually need any different care compared to their non-HIV infected counterparts but it would need better communication between HIV physicians, their GPs and their other health professionals. We put 10 questions to Health Minister Michelle O'Neill, including asking if and when a new sexual health promotion strategy would be established and for her view on the diagnosis figures. We also asked about HIV training for medical staff, any preparations for people growing old with HIV and the issue of stigma for people living with the virus. Click here to read the response from the Department of Health issued late last night. The photography for this project is by William Cherry, Press Eye, and graphic design by Chris Scott. Click here to read the stories of people living with HIV. To access the full HIV data, including information on HIV testing by GUM clinics, click here. There is more information and advice from Positive Life on HIV here.